This THP is about 7 miles NE of Trinidad, CA and Highway 101 and within a mile of the SW boundary of Redwood National Park at an elevation of 560 to 1,960 feet. Green Diamond Resource Company is planning a mostly clearcut feller buncher, shovel and cable logging operation on steep and unstable slopes in redwood, Douglas fir, grand fir, bishop pine, Sitka spruce and western hemlock forests. 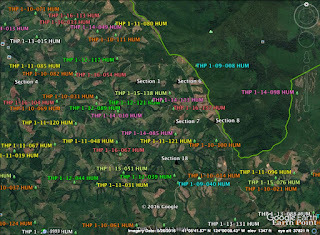 There are 12 landslide terrain sites in the THP area including; 1 unstable area along the eastern portion of unit A, 2 unstable areas along the eastern boundary of unit B, 2 unstable areas along the southern portion of unit C, 3 unstable areas in unit D, 3 unstable areas along the western portion of unit F, and an unstable area along the SW corner of unit G. Green Diamond Resource Company is planning to use temporary roads and landings during the winter period, and construct a new temporary road inside a class II (mid sized) watercourse area in unit D. Five road drainage sites are planned for work including rocking, dip construction, ditch cleaning, culvert repair/replacement and restoration of washed out crossings. The "Clear Creek" marbled murrelet stand is located within .25 miles of units D and F, and the mainline BL 2000 Road, and also on Humboldt Redwoods State Park lands within .25 miles of the mainline LP Mill Road. There is an osprey nest tree within .25 miles of the LP Mill Road, within .25 miles of the BL 2660 Road, and 2 osprey nest trees within .25 miles of the BL 2000 Road. A sharp shinned hawk was observed in 2000, 1.7 miles west of the THP area, coastal tailed frogs are known to occur in unit B, and southern torrent salamanders are known to occur immediately within and adjacent to units B and D. A newly colonized great blue heron rockery is located .22 miles east of the BL 2000 Road. 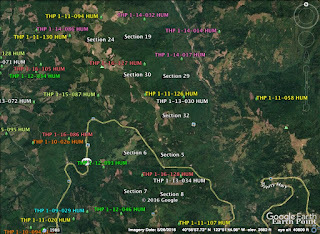 There are 5 spotted owl nesting territories within 1.3 miles of the THP area, including spotted owl nesting territories within .25 miles of units A and B, and within .5 miles of unit C.
Green Diamond Resource Company to clearcut log trees up to 60” dbh east of Redwood National Park. This THP is about 15 miles NE of Trinidad, CA and about 4 miles east of Redwood National Park at an elevation of 1,800 to 2,800 feet. Green Diamond Resource Company is planning a tractor and cable logging operation on steep and unstable slopes in Douglas fir forests. The THP Area Flows into the Lower Klamath River watershed which is listed as an impaired watershed for sediment, temperature, nutrients and dissolved oxygen. There is a deep seated landslide terrain site located in the NE corner of unit D, 5 shallow rapid landslide terrain sites related to road fill failures adjacent to the northern boundary of unit D, and a shallow rapid landslide terrain site that originated along the outboard fill of a legacy skid road in unit F. Green Diamond Resource Company is planning to use temporary roads and landings during the winter period, and use ground based equipment on 2 existing skid roads in areas designated for cable logging in unit C. Eleven road drainage sites are planned for work including rocking, dip construction, ditch cleaning, culvert repair/replacement and restoration of washed out crossings. Golden eagles have been spotted within .5 miles of the THP area. 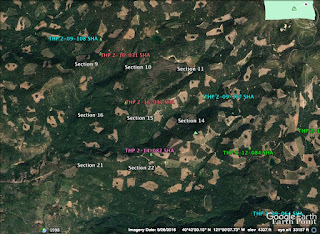 There are seven spotted owl nesting territories within 1.3 miles of the THP area, including spotted owl nesting territories within .5 miles of units A and C.
Green Diamond Resource Company to clearcut log trees up to 50” dbh east of Redwood National Park. This THP is about 7 miles SE of Klamath, CA, and just east of highway 101 and Redwood National Park at an elevation of 600 to 1,800 feet. Green Diamond Resource Company is planning a mostly clearcut tractor and cable logging operation on steep and unstable slopes in redwood and Douglas fir forests. The THP Area Flows into the Lower Klamath River watershed which is listed as an impaired watershed for sediment, temperature, nutrients and dissolved oxygen. There are multiple landslide terrain sites including; a shallow rapid landslide terrain site located on a haul road fill slope along the southern boundary of unit B, a small cut slope failure located upslope of a larger fill slope failure that has deposited debris on a road surface, and deep seated landslide terrain sites, including a headwall swale along the northern portion of unit F. Green Diamond Resource Company is planning to re-construct 100 feet of seasonal road inside a class II (mid sized) watercourse, and re-construct 130 feet of temporary road inside a class III (intermittent) watercourse area. Five road drainage sites are planned for work including rocking, dip construction, ditch cleaning, culvert repair/replacement and restoration of washed out crossings. 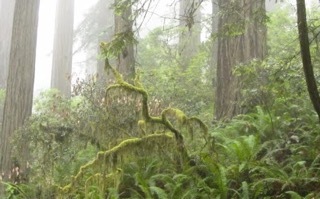 Marbled murrelet habitat is located in Prairie Creek Redwoods State Park lands within .25 miles of the CL North Road. Bald eagles were reported along the Klamath River .9 miles east of the THP area, an historic great blue heron rockery is located .6 miles NE of the THP area, tailed frogs are known to occur immediately adjacent to unit G, and a ruffed grouse was spotted in 1991 close to unit H. There are 5 spotted owl nesting territories within 1.3 miles of the THP area, including nesting territories within .25 miles of units A, B, C, E and H, and within .5 miles of units D, F and I.
Mendocino Redwood Company to log on steep and unstable slopes NE of Westport, CA. This THP is a few miles east of Highway 1, and about 3 miles NE of Westport, CA along the Mendocino coastline. 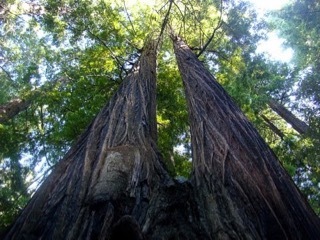 Mendocino Redwood Company is planning a tractor and cable logging operation on steep and unstable slopes in redwood, Douglas fir and western hemlock forests at an elevation of 260 to 2,100 feet. There are 49 landslide terrain and road failure sites including; shallow and dormant earth flows, debris slides, debris slopes, rockslides, disrupted ground, cut bank failures, fill slope failures, steep scarps and bank sloughing. Many of the landslide terrain features and road failure sites are related to watercourse areas and legacy roads that we will be cable logged instead of tractor logged. Mendocino Redwood Company is planning to use ground based equipment on unstable slopes, and use ground based equipment on steep slopes over 65% grade in unit 4. They also are planning to construct and use steep segments of roads over 15% grade for distances greater than 500 feet. 42 road drainage sites are planned for work including rocking, dip construction, ditch cleaning, culvert repair/replacement and restoration of washed out crossings. Tailed frogs and southern torrent salamanders were reported in the Rock Creek and Howard watersheds. Over 200 Humboldt milk vetch plants and 75 redwood lily plants were found along roads in sections 2, 3 and 10. There are 4 spotted owl nesting territories within .7 miles of the THP area. 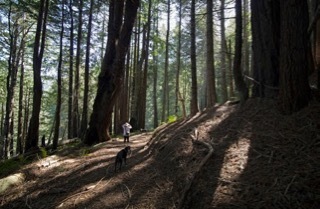 Mendocino Redwood Company to log on steep and unstable slopes SE of Fort Bragg, CA. 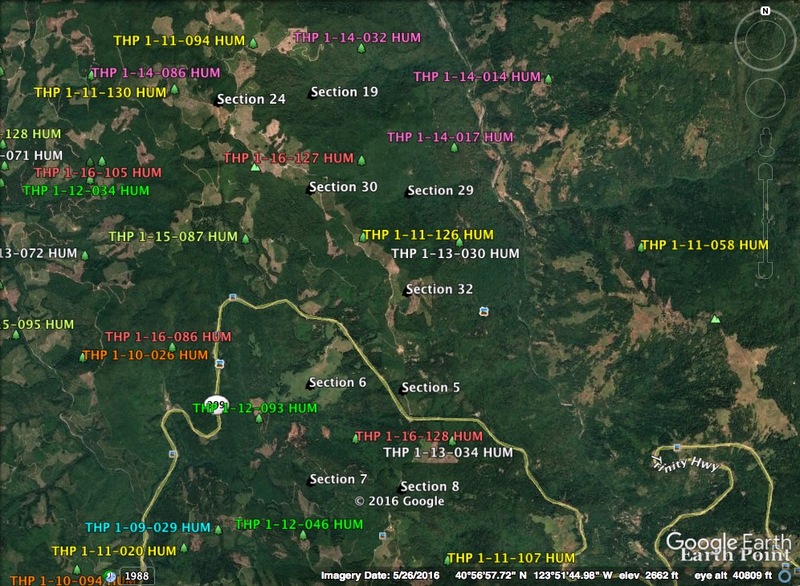 This THP is about 12 miles SE of Fort Bragg, CA and about 12.5 miles SW of Willits, CA at an elevation of 200 to 1,000 feet. Mendocino Redwood Company is planning a tractor based logging operation on steep and unstable slopes in redwood and Douglas fir forests. The THP Area Flows into the Big River which is listed as an impaired watershed for sediment and temperature. 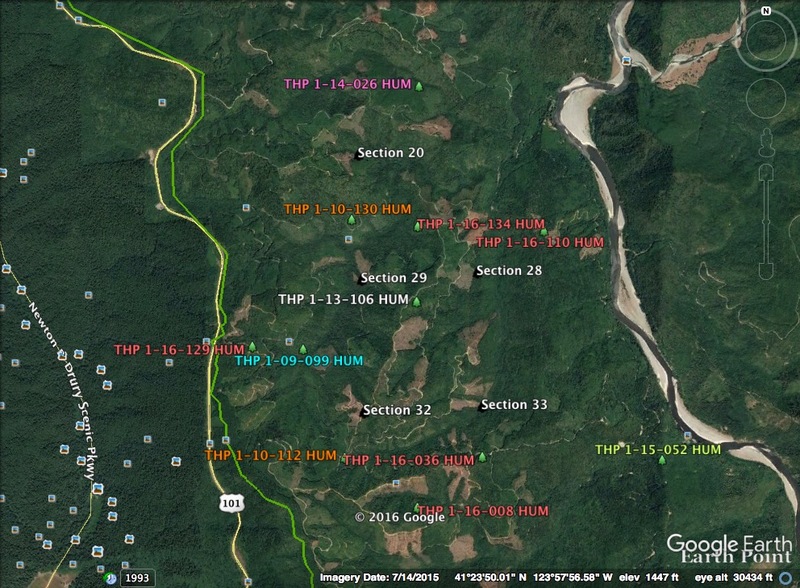 There are 13 landslide terrain sites in the THP area; including 11 sites which were excluded from operations, and 2 sites within THP units (dormant debris slope/fill slope failure and debris slide gully). Mendocino Redwood Company wants to use ground based equipment on steep slopes over 65% grade, and construct 100 feet of an existing road that crosses an unstable area. Two short segments of tractor roads are proposed for use that enter a class II (mid sized) watercourse area, 1 short segment of tractor road is proposed for use that enters a class III (intermittent) watercourse area, and 2 landings are proposed for use inside a class I (year round) watercourse area. 26 road drainage sites are planned for work including rocking, dip construction, ditch cleaning, and culvert repair/replacement. California pine foot, glory bush and Oregon goldthread were reported in section 17. There are 5 spotted owl nesting territories within .7 miles of the THP area. 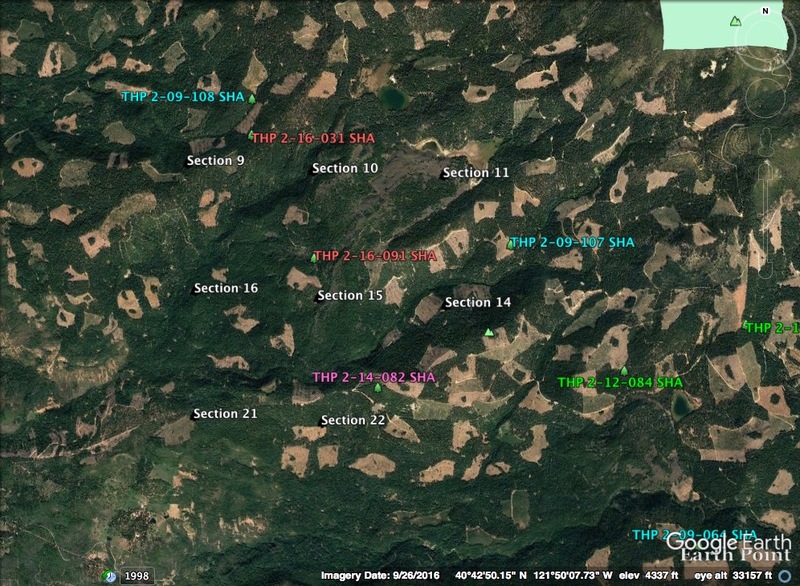 This THP is about 9 miles SE of Klamath, CA and just east of Highway 101 and Redwood National Park (units A and D are adjacent) at an elevation of 880 to 1,650 feet. Green Diamond Resource Company is planning a mostly clearcut tractor and cable logging operation in redwood and Douglas fir forests. The THP area flows into the Klamath River which is listed as an impaired watershed for sediment, temperature, dissolved oxygen and nutrients. 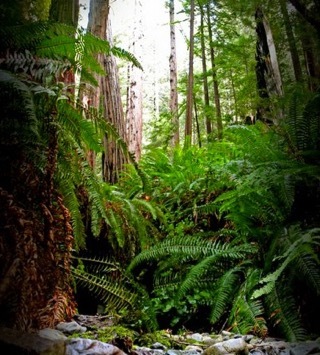 A Special Treatment Area (STA) has been designated to hide the effects of clearcutting along the boundary of Redwood National Park with units A and D. 6 road drainage sites are planned for work including rocking, dip construction, ditch cleaning, culvert repair/replacement and restoration of washed out crossings. There are bald eagle and osprey nesting territories 2.5 miles east of the THP area along the Klamath River, and an historic great blue heron rockery 2.2 miles east of the THP area. Marbled murrelet habitat is located within .25 miles of unit A in Prairie Creek Redwoods State Park, and the CL North Road. 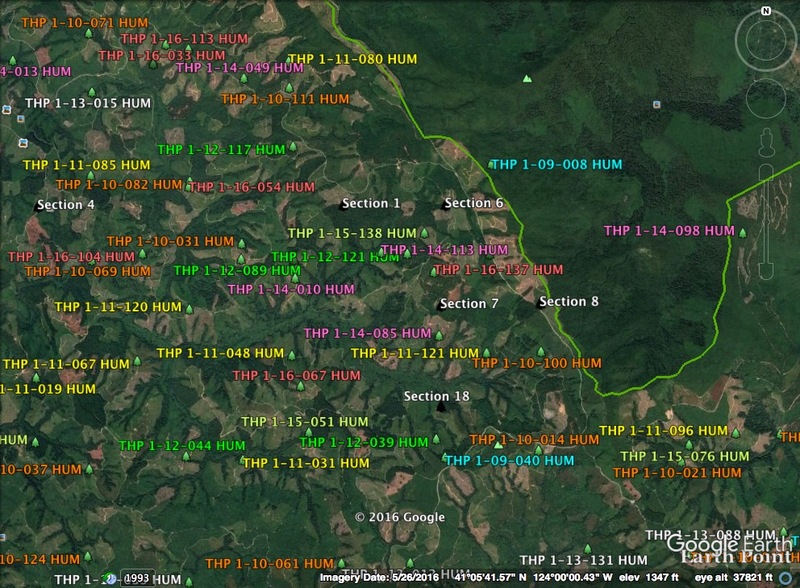 Two spotted owl nesting territories are located within 1.3 miles of the THP area. 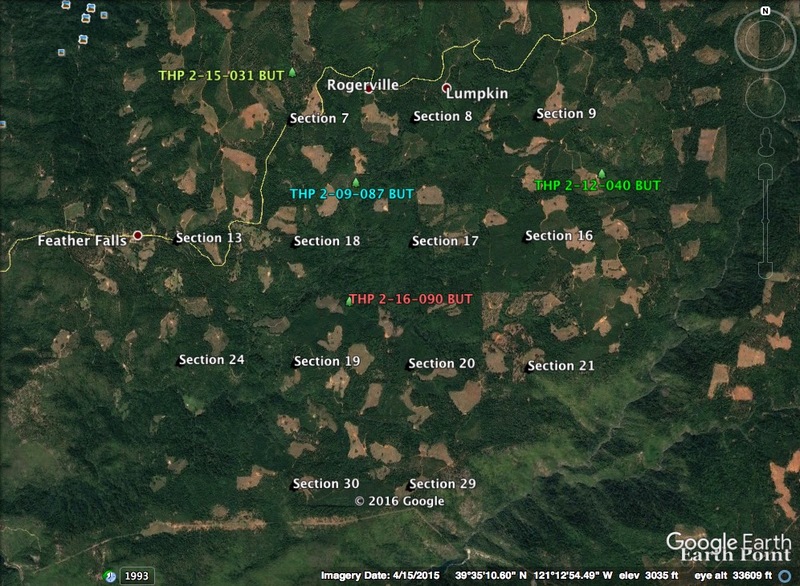 Roseburg Resources Company to clearcut log SW of Burney, CA and Highway 299. This THP is about 10 miles SW of Burney, CA and about 8 miles south of the town of Montgomery Creek and Highway 299 at an elevation of 3,300 to 5,000 feet. Roseburg Resources Company is planning a mostly clearcut tractor and cable logging operation on steep and unstable slopes in ponderosa pine, sugar pine, Douglas fir, white fir and incense cedar forests. There are 4 mapped unstable areas in units 1603, 1606, 1605W, and 1001, including 2 pre historic dormant landslide terrain sites in the northern portion of unit 1603W. Roseburg Resources Company is planning to use and construct roads/landings during the winter period, and use ground based equipment in areas designated for cable logging. Seven road drainage sites are planned for work including rocking, dip construction, ditch cleaning, culvert repair/replacement. Northern goshawk has been reported 1.5 miles north of the THP area, and bald eagles have been sighted .25 miles east of the THP area at nearby Arthur Lake. Cascade frogs were reported at Arthur Lake .25 miles east of the THP Area, and at Silver Lake .5 miles NE of the THP area. Rattlesnake fern was found in section 20, northern clarkia was found in section 22 adjacent to unit 1503 along the D Line Road, Butte county fritillary was found in the SE corner of section 13, on the west side of section 16 near unit 1601, and in the SE portion of section 17. Sierra Pacific Industries to clearcut log near Feather Falls east of Lake Oroville. This THP is just south and east of the town of Feather Falls, CA and about 5 miles east of Lake Oroville at an elevation of 2,680 to 3,960 feet. Sierra Pacific Industries is planning a mostly clearcut tractor and cable logging operation on steep and unstable slopes in ponderosa pine, sugar pine, white fir, Douglas fir and incense cedar forests. There is an unstable area in section 19 on either side of a class III (intermittent) watercourse in unit 4. SPI is planning to use and construction roads/landings during the winter period, and construct 1.5 miles of fuel break along the E Line Road. 55 road drainage sites are planned for work including rocking, dip construction, ditch cleaning, culvert repair/replacement and restoration of washed out crossings. Humboldt lily was found in sections 24 and 29, Sanborn's onion was found in section 29, Sierra foothills brodiaea was found in sections 20 and 29, Mosquin's clarkia was found in section 29, sulphur flower buckwheat was found in sections 29 and 32, and Butte county fritillary was found in section 32. There are 5 CA spotted owl nesting territories within 1.3 miles of the THP area, including spotted owl nesting territories in sections 6, 15, 17, and 19. This THP is a few miles north of the Highway 299 coast range summit between Arcata, CA and Willow Creek, CA at an elevation of 640 to 3,400 feet. 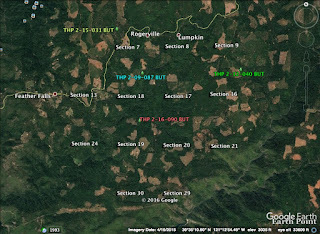 Green Diamond Resource Company is planning a mostly clearcut (rehab) feller buncher, shovel and cable logging operation on steep and unstable slopes in Douglas fir and western hemlock forests. The THP Area Flows into Redwood Creek which is listed as an impaired watershed for sediment and temperature. There is a small landslide area in unit A that originates from a fill slope off a road into a class II (mid sized) watercourse area. Green Diamond Resource Company is planning to use temporary roads and landings during the the winter period. Nine road drainage sites are planned for work including rocking, dip construction, ditch cleaning and culvert repair/replacement. Southern torrent salamanders were reported in unit D. There are seven spotted owl nesting territories within 1.3 miles of the THP area, including nesting territories within .5 miles of units F and G. This THP is just north of Green Diamond Resource Company’s recently proposed Long Prairie THP 1-16-128 HUM. This THP is about a mile south of the Highway 299 coast range summit between Arcata, CA and Willow Creek, CA at an elevation of 1,200 to 2,200 feet. 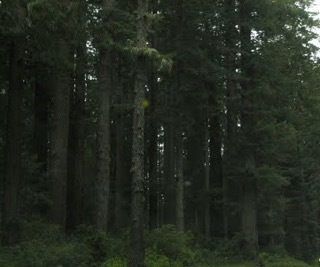 Green Diamond Resource Company is planning a mostly clearcut feller buncher, shovel and cable logging operation on steep and unstable slopes in Douglas fir and grand fir forests. The THP areas flows into the Mad River which is listed as an impaired watershed for sediment, turbidity and temperature. Seven landslide terrain sites were found along the road system and within units B and C, including several unstable areas along the K&K Road, a fill failure from a poorly designed skid trail crossing, and several road related cut slope failures. 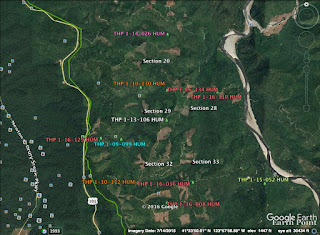 Green Diamond Resource Company is planning to use heavy equipment in unstable areas to re-align a portion of the K&K 95.49 Road around an unstable area, re-construct a failed class II (mid sized) watercourse crossing and fill failure along the NW portion of Road 13, and re-open portions of the K&K 95.49L Road that were blocked by cut bank failures. Two roads are proposed that have average grades above 15% with pitches of 20% or greater for over 500 feet in units C and E. 20 road drainage sites are planned for work including rocking, dip construction, ditch cleaning and restoration of washed out crossings. A pacific fisher was reported within unit C, red tree voles have been observed in units C and D, and southern torrent salamanders are known to occur immediately adjacent to unit D. There are 8 spotted owl nesting territories within 1.3 miles of the THP area, including spotted owl nesting territories within .25 miles of units A, B, C, D, and within .5 miles of unit E. This THP is just south of Green Diamond Resource Company’s recently proposed Wiregrass East THP 1-16-127 HUM. Humboldt Redwood Company to log inside marbled murrelet stands 268C, 246C, 274C and 302C with trees up to 60” dbh near Weott. This THP is about 4 miles NE of Weott, CA and Highway 101 at an elevation of 190 to 2,880 feet. Humboldt Redwood Company is planning a tractor and cable logging operation on steep and unstable slopes in redwood, Douglas fir and grand fir forests. There are multiple dormant and active landslide terrain sites including debris slides, inner gorge and cut slope failures. Larabee Creek flows into the Eel River which is listed as an impaired watershed for sediment/siltation and temperature. Humboldt Redwood Company is planning to use use ground based equipment on existing skid trails in areas designated for cable logging. 16 road drainage sites are planned for work including rocking, dip construction, ditch cleaning and culvert repair/replacement. There are trees up to 60" dbh in units 1, 2, 3, 4, and 5 and logging is proposed inside large tree marbled murrelet stands 268C, 246C, 274C and 302C. A peregrine falcon nesting territory is located within .5 miles of Shively Road near Holmes Bluff, and an historic golden eagle nest tree is located near Larabee Creek. Willow flycatcher habitat is located along Larabee Creek in sections 1 and 6 and within unit 1. There are 9 spotted owl nesting territories within 1.3 miles of the THP area, including a nest tree in unit 2.